Class A Tehsildar jobs. Total 18 vacancies of Class A Tehsildar in this HPSC recruitment 2018. Online application form submission last date for this HPSC Class A Tehsildar jobs is 04-09-2018. Official website to submit the application online is www.hpsc.gov.in. HPSC Class A Tehsildar jobs recruitment will be through written exam and interview only. 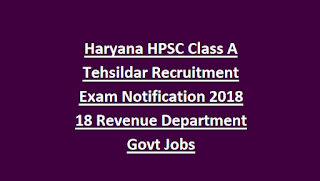 For more details regarding Revenue Department of Haryana PSC Class A Tahsildar vacancies age limits, exam pattern, selection process and other details are given below. 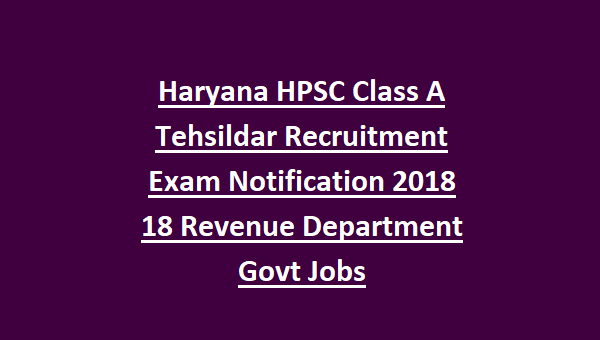 There are total 18 posts in this HPSC Haryana Revenue Department Class A Tehsildar Recruitment Exam 2018. Degree qualified Candidates are eligible for these Haryana revenue department vacancies. The candidate's age limits as on 01-01-2018 is 21-42 years. For HARYANA State SC/ST/BC, SBC and EBP candidates upper age limit is relaxed up to 5 years. Selection for this HPSC Naib Tehsildar recruitment will be held based on objective type prelims written exam, descriptive type mains exam and interview. Exam Pattern and Syllabus will be updated soon. Candidates belongs to Haryana State SC/ST/BC, all women candidates is Rs.250/- and for all other Rs.1000/-. For PWD candidates application fee is nill. Fee payment last date is 04-09-2018. Online mode of applications is accepted for this HPSC Naib Tehsildar recruitment. Last date for applying online is 04-09-2018. Submit application through www.hpsc.gov.in. Download official notification here for Vacancies in Revenue Department.